Do you have a cracked, chipped or decayed tooth? If so, there’s a chance that you’ll need a new crown to fully restore it. But how is it constructed, and what’s the process for having it placed? Your dentist in San Antonio says that with the advances in dental technology and techniques, the process is simple and easy. He’ll provide more details on this method of restoration as you continue reading. The crown of your tooth is the part that is visible above the gumline. It does all of the hard work like biting and chewing food, enduring all the acids that are involved in digestion and maintaining an equilibrium within your jawbone. Thankfully, crowns now offer an aesthetic aspect, as the most popular kind is the tooth-colored version custom-crafted from ceramic. So you’ll have both a sound and beautiful tooth! Given Its Importance, How Does the Crown Get Damaged? If you have advanced tooth decay, there’s a good chance that the crown may need to be replaced. A bad break can also require a replacement crown. If you lose a tooth and have a dental implant inserted (replacing the missing root), your dentist can fit it with a replacement crown to fully restore the tooth. Your dental crown is important because it houses valuable material – the dentin and inner tooth (which contains the nerves). If your crown is not sound, it leaves these more vulnerable parts of the tooth open for attack from bacteria and food particles. A solid crown, though, will ensure that you have a fully functioning tooth that is healthy and strong. You’ll start with an initial consultation with your dentist. Then, whatever work needs to be done to prepare the tooth will be completed. That also includes any initial restoration procedures like a root canal or filling. Your dentist will then take impressions and fit you with a temporary restoration while your permanent fixture is fabricated at a special lab. Once the finished version is ready, you’ll return to your dentist so that he can place your dental crown in San Antonio. 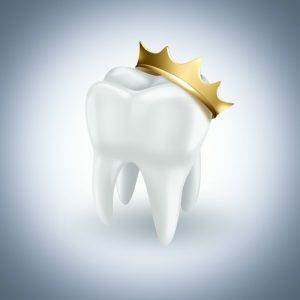 So now that you know more about the crown restoration procedure, the next step is to reach out to your dentist to schedule an appointment for you to treat your tooth like royalty! For over three decades, Dr. Troy Jones has been delivering top-notch dental care to his patients. A graduate of the University of Texas Health Science Center at San Antonio, he remains driven to broaden his knowledge by maintaining membership with several professional organizations. Dr. Jones practices at Jones & Knight and can be reached for more information through his website.